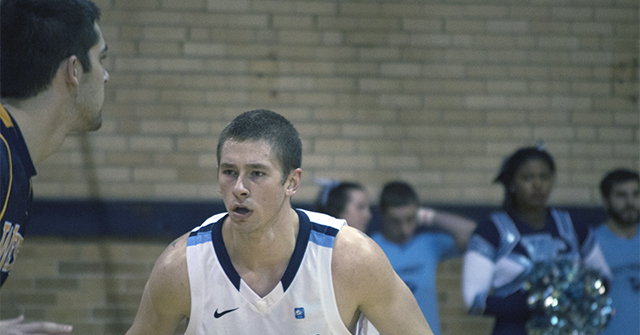 The Westminster men’s basketball team was unable to keep up with MacMurray on Saturday, January 3 and fell 76-64. The Blue Jays are now 1-3 in conference play and 2-9 overall. The Blue Jays and Highlanders battled back-and-forth until freshman Jimmy Villalobos put in a layup and was fouled on the way up. He drained the free throw to take the 16-15 lead. The Blue Jays then struck an 8-2 run to take the 24-17 lead. The Highlanders came back to tie the game with 4 minutes remaining in the half. They took the 32-30 lead with 41 seconds remaining in the half, but freshman Tanner Cochran drained both free throws with 26 seconds to tie the game at 32-32 heading into halftime. The Blue Jays took the lead four minutes into the second half with a layup by junior Tanner Gentges. The Highlanders took back the lead with 14:37 left in the game, and followed with an 10-2 run to take a 50-42 lead. Cochran scored on a layup, followed by an “and one” to put the Blue Jays within seven, 54-47. With 7 minutes remaining in the game, senior Verdis Lee Jr. sank both free throws, and with 5:21 on the clock, Cochran went 1-2 from the foul line to bring the game within five, 58-53. The Highlanders extended their lead, but two more good free throws from Lee Jr. put the Blue Jays back within five with one minute remaining, 69-64. The Blue Jays were unable to cut the lead again, and in the final minute of the game, MacMurray scored seven unanswered points to win 76-64. Junior Kellen Brondel led the Blue Jays with 13 points and 7 rebounds. Cochran followed with 12 points and 6 rebounds. Lee Jr. finished with five steals and three assists, and Gentges had four assists and four steals. The Blue Jays travel to Elsah, Illinois on Tuesday, January 6 to take on Principia College at 8:00 p.m.